Hailing from Brisbane, Caligula’s Horse are one of Australia’s progressive heavy music treasures. Their unique tapestry of progressive metal laced with raw rock power is at once fluid, monumental, and striking. Their fourth record, the 2017 immense concept album In Contact, left audiences breathless as it cracked the Top 50 ARIA charts. Euroblast, ProgPower, Very Prog, AMFest and Damnation, plus a sold out London show. Their breathtaking live performances continue to receive rave reviews worldwide for their elegance, intensity and sheer emotional power. Beyond Creation were guests on NeO’s Citadel tour in 2014 so fans will be familiar with the Canadian progressive death metallers. The band spent 3 solid years on the road promoting their Earthborn Evolution album and playing almost every festival there is and gaining a legion of fans in the process. This ultimately led to their 3rd album, the recently released, Algorythm, becoming one of the most highly anticipated heavy releases of 2018! Beyond Creation are now considered one of the worldwide leaders in modern technical death metal, and Algorythm is a study in the forward motion of intelligent, progressive extremity. Allegaeon have been described by Metal Hammer Magazine as ’the new face of ruthless modern death metal’ and they would be correct. The Colorado natives deliver a musically complex, intelligent, and absorbing sound that can rightfully sit alongside the true greats of the genre. Lauded for their extreme technicality and capacity for writing music of truly epic scale, the band embody the term ‘progressive’ more than most, with their current release, Proponent For Sentience featuring orchestral movements and even throat singing! The band toured with Ne Obliviscaris on their North American and European headline tours in 2017/18. Having racked up over 60 shows together, NeO are finally bringing them to Australia for their first ever visit to our shores! 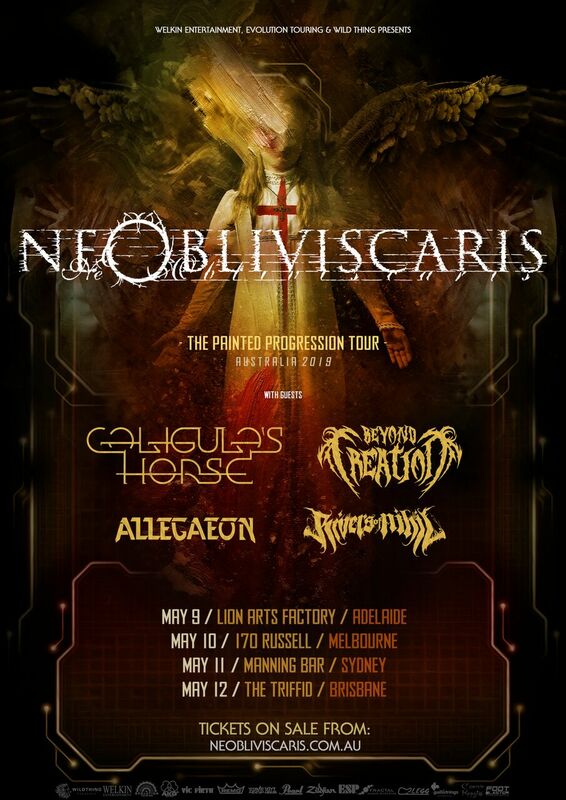 Rivers Of Nihil will be venturing to Australia for the first time ever on The Painted Progression tour. Their third album, Where Owls Know My Name, was released in early 2018 and has featured on many ‘best of 2018’ end of year lists from heavy music media around the globe. While being punishing purveyors of modern death metal, the band also assimilate ingredients from musical genres as varied as electronica, jazz, alternative and folk. With so much incredible music on offer over the course of one evening, this tour is an absolute must see for any fan of boundary pushing heavy music. Get your tickets fast, a line up like this is guaranteed to be one of the most talked about events of the year!